The World Poker Tour Lucky Hearts Championship Event starts on January 19. 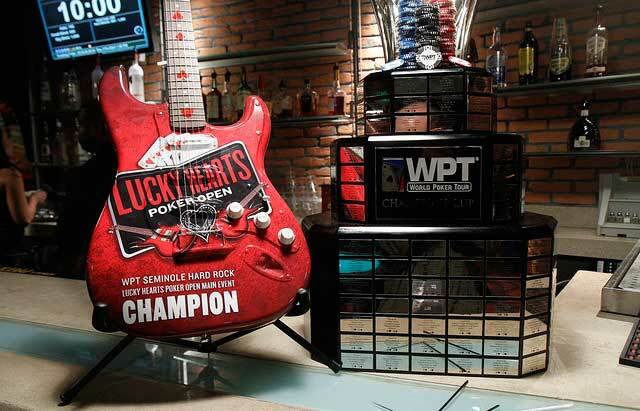 After a two year absence, the World Poker Tour brings a Championship Event back to the Lucky Hearts Poker Open at the Seminole Hard Rock Hotel and Casino in Hollywood, Florida. Set to take place from January 19-24, the $3,500 Main Event buy-in comes with a $2,000,000 guarantee. For those who are looking to find shade from the South Florida sun and take a seat at the tables, here is everything you need to know about the big event. The Lucky Hearts Main Event offers two starting days, the first of which begins on January 19 at noon local time. While there is no re-entry during each individual day, players who opt to play Day 1A and bust are eligible to give it a second shot on Day 1B. Additionally, if players have a stack at the end of Day 1A, but they are unhappy with their stack size, they would need to forfeit that in order to register Day 1B. Days one and two have 60-minute levels, after that the time increases to 90 minutes until a final table of six is reached. Once your there, the levels drop back to 60 minutes and should you be lucky enough to make it heads-up, 30-minute levels are enacted. The WPT Action Clock will be active one the tournament reaches one table outside the money. The Action Clock, which has been touted as a positive addition to the WPT’s major tournaments, gives players 30 seconds in which to make decisions, cutting back on excessive tanking and allowing players to get more hands in per hour. The $2,000,000 guarantee is very likely to be crushed when all is said and done but it’s no sure thing. Of all the previous years in which the WPT brought a Championship Event to the Lucky Hearts Poker open only 2015’s Season XIII event eclipsed that large of a prize pool. That year, Brian Altman bested a field of 1,027 to take home $723,008 from a total prize pool of over $3.2 million. In Season X, the WPT Main Event was a part of the Lucky Hearts Showdown and the $3,500 buy-in only saw 295 runners. The next year in Season XI, attendance rose and the Lucky Hearts Main Event received a large PR boost with a star-studded final table. Darryl Fish and Matt Salsberg made the final table that saw Matt Giannetti defeat Lily Kiletto heads-up to win $323,804 and the title of WPT Champion. Attendance jumped again to 415 in 2014 when James Calderaro won out over Shannon Shorr and Keven Stammen for over $270,000. Expectations are high for this year and much of that is due to the popularity and involvement of the WPTDeepStacks brand. During the multi-year hiatus of the WPT main tour at the Lucky Hearts, the WPTDeepStacks have run one of their Main Events during the festival. The past two years have seen a pair of notable names take down the Lucky Hearts WPTDeepStacks with Salomon Ponte’s win in 2016 and Jerry Wong’s victory in 2017. This year the WPTDeepStacks teams up with the main tour for and opens the Lucky Hearts Poker Open with their $1,000,000 guarantee on January 11. In addition to the WPTDeepStacks event, there are plenty of chances for players satellite into the $3,500 Main Event. Eighteen different Mega Satellites will take place starting as early as January 14. In total, the schedule guarantees over 85 seats to the Championship event with buy-ins ranging from $140-$390. Finally, if that wasn’t enough action to pull you into the land of poker and palm trees there are a number of scheduled post-lims including a $25,500 High Roller and a $50,000 High Roller both with a $1,000,000 guarantee. The Lucky Hearts Poker Open festival kicks off on January 11. The $3,500 World Poker Tour Championship event, a five-day affair with a live-streamed final table, starts on January 19.